To watch the vids below, right-click and select "Save Target As..". Janeway struggles with her dark side, can Seven lead her into the light? The Admiral tries to make her fairytale come true. Dedicated to One of Three. 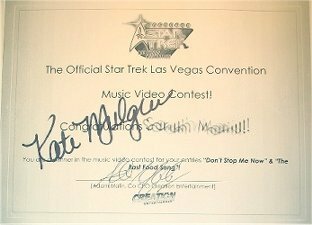 Janeway and Seven share a duet and I take my first foray into the world of Sony Vegas after over 250 videos made with another application! What if Janeway hadn't been so willing to offer help to Seven even though she desperately needed it? All the best of the last 12 months! Seven leads the ship in a Christmas celebration. Janeway struggles to find a way to tell Seven how she feels. The crew can see the blindingly obvious but will Janeway heed their advice? Unfortunately red swimsuits are not included! Janeway and Seven's relationship is full of sparks! 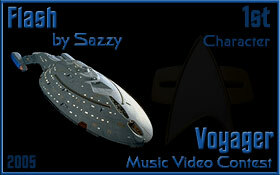 It's one big camp party aboard the Sim-ship Voyager! Seven has something to tell Chakotay. Thanks to Balbalala for the manip! What if the rest of the crew turned against Seven? Whose side would Janeway take? Something a little different, almost like a trailer for "J/7 - The Movie!" Janeway introduces Seven to the whole new world of... astrometrics! Seven's epic tale, all 6 minutes of it! Boots have a lot to answer for with those bloody adverts! 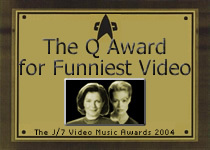 Awards for "Star Trek Voyager The Movie"
Janeway shows off her dos. Thanks to ximh for the initial concept. Starship captain...what a way to make a living! A third attempt at this one! Loads of temporal weridness abounds. Watch out world - Janeway's coming! Awards for "Don't Stop Me Now"
Pirates of the Caribbean 2 is out today, and this is from the first film - "He's a Pirate"
A little scariness for Halloween! Digitally remastered and updated Chakotay bashing at its best! Season four action with "Raiders Of The Lost Ark"
All the action from season three to "The Empire Strikes Back"
Everyone takes a trip to the gay bar! Ever thought Voyager was a little scary in seasons 1 - 3? 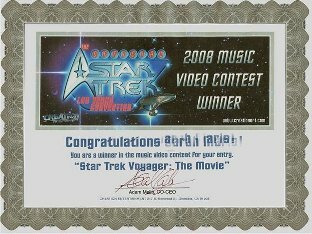 It's musical The Voyager Conspiracy! 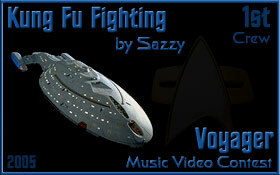 This is Betsy's love song for Janeway - yes, it's a singing gun! A light-hearted look at Endgame for a change, with lots of J/Admrial action! The Killing Game to music!